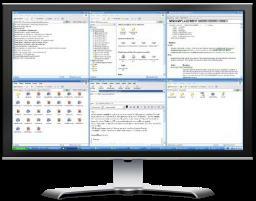 It is always useful to have multiple monitors being set up for more efficiency work but in case you don’t have budget to add extra monitors to it, here is a simple software utility that can help you to organize your opened windows more systematicly so that users can view and make cross reference in simple steps. During installation process, there are two options that users can select to either install it in normal way or just copy it into specific folder as a portable application so that it can be transferred to removable thumb drive to be used in other PCs. Once completed, you will notice a new icon displayed on the system tray. Clicking on it will pop up a small menu that allows users to resize any windows to bottom left, center, top right or etc without the hassle of trying to adjust them manually. The utility provides an option to change layout at own preference and when combining with the hotkey settings, it simplifies the steps required to move any windows to desired location precisely. Just imagine, now users can just hit on the hotkeys to get all the windows arranged well in tiny monitor screen. Winsplit Revolution is compatible with Windows 2000, XP and both Vista 32 and 64-bits and it is free for download here for immediate use.